Tim Lawson submitted this photo and caption. These two photos are of me and my best friend ever Kim Weichbrodt. We were both members of Southwind in 2006 and 2007. After the World Championship Quarterfinals in 2006, it became a tradition for her parents to take a picture of us together for the last time in uniform. 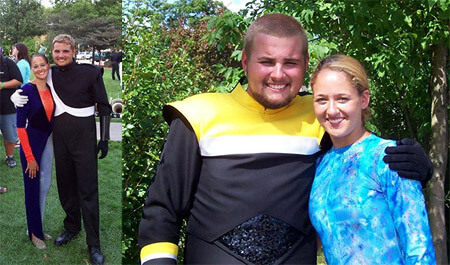 While I live in South Carolina and she lives in Wisconsin, many miles separate us, but drum corps keeps us together! I honestly do not know how I would have survived without her. 2008 will be Kim's "age-out" year, and I have three years left to march. We are making plans to audition for the same corps and spend our last summer on the road together!